Bartolomé Esteban Murillo was born in Seville where he was baptised on 1 January 1618. Murillo was the last of the fourteen children of Gaspar Esteban, a surgeon, blood-letter and barber, but he always used and signed his works with his maternal grandmother’s surname of Murillo. At the age of nine he was orphaned and was brought up by his sister and her husband, also a surgeon and barber. Little is known of Murillo’s earliest years or his apprenticeship other than that, according to Palomino, he trained in the studio of Juan del Castillo in Seville. In 1645 Murillo married Beatriz Cabrera y Villalobos, and from that date on we have more detailed information on his life and activities. Murillo’s first major commission, executed between 1645 and 1646, was for the decoration of the cloister of the monastery of San Francisco. The success of this project brought him numerous commissions from the Church and following the crisis in Seville of the 1650s he became the city’s most prestigious artist. In 1658 Murillo travelled to Madrid and became familiar with the royal collections. In 1660, together with Herrera el Mozo and other Sevillian artists, Murillo founded the Academia de Pintura, intended to offer teaching and training to young painters and of which Murillo was co-director, first with Herrera and later with Valdés Leal. During these years he produced a large number of paintings for Seville cathedral as well as religious and secular compositions for a wide range of private clients. 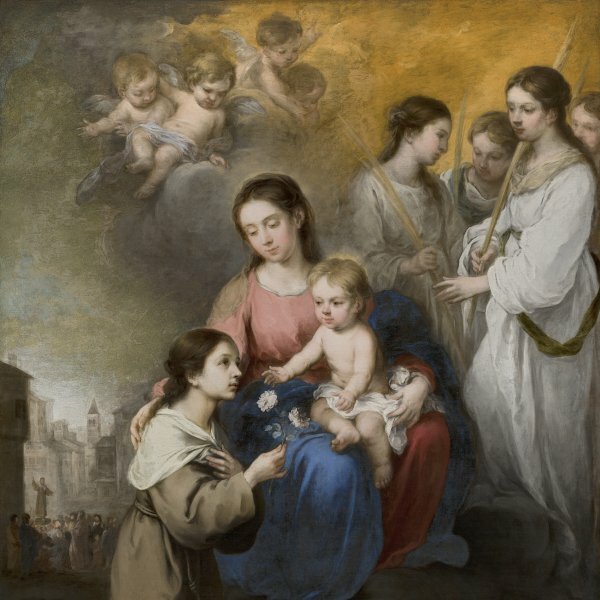 Among the secular subjects that Murillo painted were genre scenes, while his religious works include scenes from the life of Christ, idealised images of the Virgin and Child and the Immaculate Conception, and saints’ visions, such as The Vision of Saint Anthony of Padua. In 1663 Murillo was widowed, and two years later joined the Hermandad de la Caridad, for which charitable confraternity he painted eleven canvases. The following years were the most prolific of his career and between 1665 and 1672 he executed two more important commissions for Sevillian churches: one for Santa María la Blanca and the other for the Capuchin church. In the years between 1670 and his death Murillo produced his most intimate compositions, organised around a limited number of figures located in ample spatial settings, creating a uniquely calm, reflective mood, for example The Immaculate Conception (Museo Nacional del Prado, Madrid). Murillo had a large number of followers and imitators and was one of the Spanish artists most celebrated abroad during his lifetime.